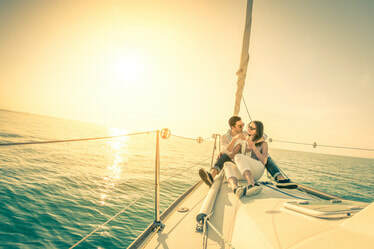 When's the last time you reviewed your boat insurance policy? Let's take a few minutes to make sure you're covered for everything and have the most affordable boat insurance rates and a policy tailored to your lifestyle and not just the value of the boat. Sailboat - come in a variety of sizes, some with cabin features. They can have single or multiple sails, and often have motors for backup power. Pontoon - usually have two aluminum barrel-like hulls under a stable deck with railings all the way around. They are versatile and can be used for fishing, sunbathing and cruising around inland lakes. They often have a sun canopy to provide a shaded area and ample seating; most often powered by outboards. Bass Boat - designed to get to the fish as quickly as possible, these boats are usually outfitted with larger outboard motors. There are storage areas on board to store fishing poles, tackle and other gear. There is often a raised-deck casting platform, swivel seating, electronics and live wells, along with a designated area for a trolling motor. PWC (Personal Watercraft) - craft built for one, two, three or more people and can be stood upon or straddled. Personal Watercraft are often referred to by their brand names such as in jet ski. Fishing Boat - these boats are disgned specifically to allow for fishing anywhere on the deck. They often have space for storing fish gear. Most are outboard powered and they may have a small cabin. Deck Boat - named for the one level deck throughout, this multi purpose craft can be used for anything from fishing, swimming, sunbathing or short cruises. They usually accommodate a number of people. Most are outboard powered but they may use stern drives. Jet Boat - powered by jet pumps that are linked to the engines, jet boats can be small craft that accommodate only a few people or larger varieties that can pull water skiers. They are typically transported to the water via trailer and cost less than most other in-board motor craft. Cabin Cruiser - these small cruisers generally outboard or stern-drive power and are great for day cruising. They have a compact cabin area to allow for overnight stays and often have simple cooking capabilities. Runabout - the multiple purpose runabout is great for a variety of activities: water skiing, fishing, swimming, tubing, wakeboarding or sunbathing. They can have an open or closed bow and can be powered by outboard or stern-drive engines.